After six months, the pearl farmer starts the operation called “détroquage,” which consists of detaching the young oysters, now called “naissains” or “spats” from the collectors. 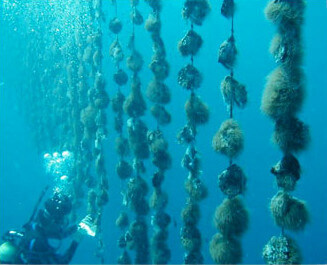 The young oysters are pierced on one side near the hinge of their shells, and hung by a nylon thread from ropes called “chapelets,” “rosaries” or “garlands.” These garlands will carry between 10 and 20 oysters and will be hung from a network of ropes in the water between 8 and 10 meters deep. The oysters will be gently cared for and regularly cleaned until they reach 10 cm wide, at about 24-36 months old. Grafting is the process of inserting a small nucleus into the mature pinctada margaritifera oyster in the hope of producing a pearl. 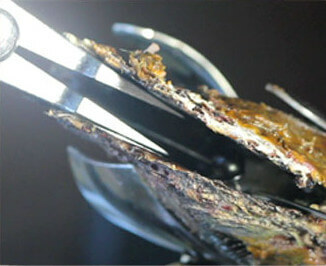 Successful grafting requires a unique combination of ideal conditions: the appropriate lagoon environment, a well prepared and healthy receiving oyster, a donor mollusk that produces a quality nucleus, and an expert grafter. The nucleus is a white bead usually obtained from a freshwater bivalve native to the Mississippi River, the legumia recta. The size of the nucleus will determine the size of the future pearl. Insertion of the nucleus stimulates an immune response in the pinctada margaritifera oyster, causing it to secrete a substance known as “nacre” that coats the nucleus. 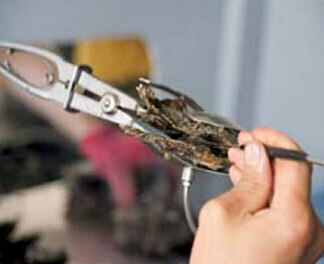 Approximately 40 days after grafting, the grafts are checked to determine the degree of success of the operation. 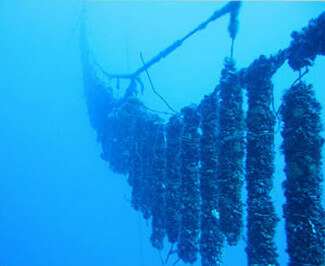 The grafted pearl-bearing oysters remain submerged in the lagoon for about 18 months in order to allow the development of a sufficient layer of nacre over the nucleus. (By regulation, the nacre layer on a Tahitian pearl must be of a minimum thickness of 0.8 mm). Throughout this period, the pearl farmer will regularly lift the oysters from the lines to remove parasites from their shells and to see to their general good health, facilitating the nacre-secretion process. The harvest Is the final stage of the process, in which the cultured pearl is carefully extracted from the oyster’s pearl sac.